One of the most important aspects of marketing your online business is reaching out and grabbing the attention of new customers. While you can get website visitors from other sources, choosing to focus on your website ranking and search engine position may yield the best results in terms of boosting your visibility. 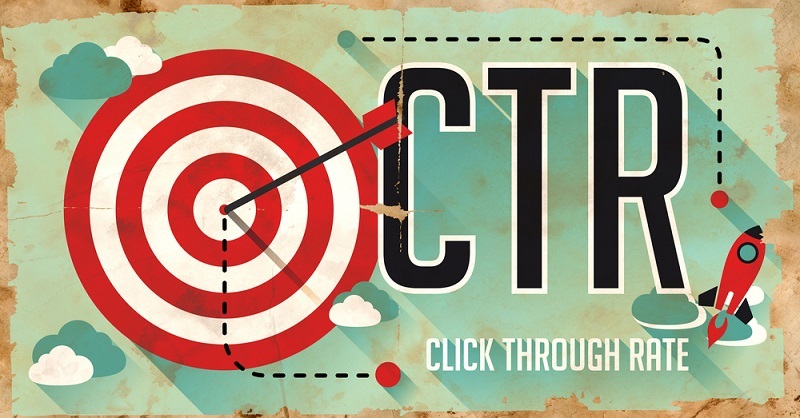 One important metric to consider is your organic click through rate (CTR). Boosting your organic click through rate means getting more people on your website and positioned to buy your products or services. What is Your Organic Click Through Rate? A click through rate (CTR) is simply the number of people who click on a link that goes to your website. There are a lot of different ways to get clicks, including advertising or social media posts. What makes a particular click organic is that it doesn’t rise from advertisements. It’s a direct click from a search where you appear because of your SEO, not your advertising budget. The number of people who click on your website in search results is your organic click through rate. The higher your rank, the more people will click on it. An increase in your organic click through rate will correspond with an increase in your traffic. Items above the fold on Google–and items that rank higher in the search–see more clicks than others. One factor in your search result placement is how many people click on your search listing. In the screenshot above, there are many factors at play that determine which result comes first. One is the organic click through rate. Since the first Google search result gets 33 percent of the traffic, anything that improves your position can help increase your business. Why is Your Organic Click Through Rate Important? Your organic click through rate gives you a metric for judging how well your keywords, titles, and meta data are doing, and whether you need to adjust them to draw more website viewers in. The less clicks your search listing gets compared to other listings, the more you’ll fall in rank. The higher your rank, the more likely your link is to get clicked on by a person who has searched for a particular keyword or phrase. You can increase your organic click through rate by making adjustments on various aspects of your Web content. Updating past content so that it matches best practices for better organic click through rates and tailoring future content with an eye toward getting more clicks can improve the amount of traffic your website gets. Another benefit to boosting your organic click through rate is that you may see a rise in your search engine positioning. 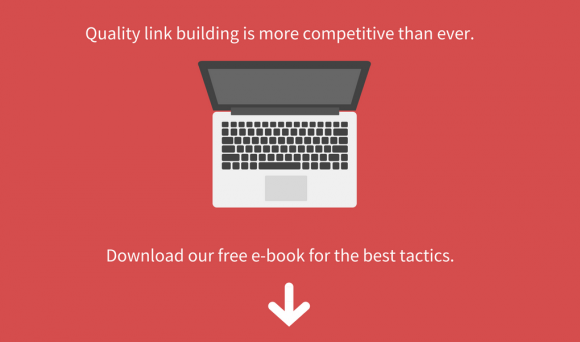 The more people who click on your link, the better you do against competitors fighting to get clicks for the same terms you’re targeting. There is also very strong evidence that click through data is taken as a ranking signal by Google. If most of your targeted keywords are short one or two word terms, think longer to see an increased click through rate. So when you’re setting up your keywords and targeting search terms with an eye toward getting more traffic, try to think of longer phrases that you want to target. If you can hit that terms length of 31-35 characters, even better. One of the first things a searcher sees when performing a search is the title of the page. There are two things to focus on when choosing a title. First, make sure it’s relevant to your content. If a title isn’t relevant and doesn’t properly represent the page, even a well-targeted link may not get a click when a searcher chooses to click another, more pertinent link. Catchy titles that don’t give information about the page or misrepresent it can lead to low clicks or low rates of return visitors. The second thing to think about is whether the title is dry or appealing. People are more likely to click on titles that tug at their heartstrings, stimulate their interest or seem to offer more utility. Before you title a page, consider whether someone glancing at it will feel a strong desire to click based on the terms you’re targeting. If you think it’s bland or unappealing, try a different title. When developing a title, try to work in the format of the piece, a power word, the type of content and your subject. All of these together will make an interesting title that will draw in more clicks. For example “Eight Shocking Questions to Ask at Job Interviews” is better than “Job Interview Questions to Ask”. Keep in mind that a change in punctuation or capitalization doesn’t create a new title, just a version of the old one that looks different. Use new words and get an entirely new take on the title instead. Go back to old content and review your titles. It’s a good idea to use targeted search terms in your titles, but that shouldn’t be the end of it. An appealing title that offers utility will draw in a searcher more quickly than just a keyword set. For example, “Children’s Books” is a possible search term that could function as a title. “Ten Children’s Books That Will Inspire You” is more emotional and likely to generate clicks. 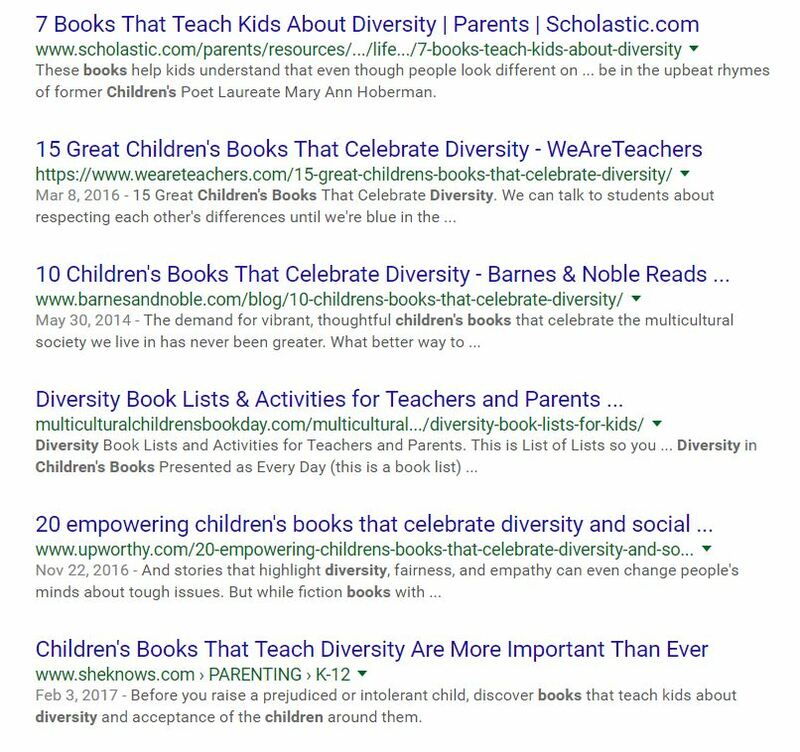 These titles use strategies for increasing clicks, which have helped them climb to the top of the Google search results for “children’s books about diversity”. Examine your current click through rate for each page and site you have. List the difference between the highest-performing pages and the lowest performing pages. Once you can clearly see the things that draw in visitors, you can adjust your content strategy to develop more content that encourages people to click on your site rather than a competitor site. Adjust your content to include lists and mention the list in the title. Searchers tend to click lists when offered headlines in a set of links both with and without lists. Most topics can be adjusted to include some type of list that works with your content. Use power words: words that evoke an emotional response. Think adjectives. “25 Delicious Pizzas to Try in Chicago” is more powerful than “Chicago Pizza”. Make custom URLs. When you use descriptive words rather than random numbers and letters in your URL, people are more likely to click it. Don’t worry about pushing your brand in the title of the page. It will be on your website, and may appear in the description of the site or the URL. Use the valuable character space you have to push the title that increases your organic click through rate. The only exception to this is if you’re a known industry leader already or are trying to rank for your brand name specifically. Reference the volume of what you’re offering. Don’t just say that you can recommend some hotels in a specific city. Instead, say the exact number. 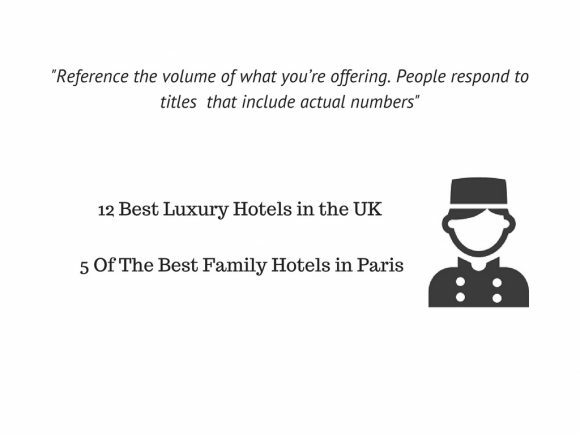 People respond to titles and descriptions that include actual numbers. If you have a special offer, giveaway or some kind of promotion, mention it in the title. Many people will never read past a title, so leading with your best foot forward can help pull a skimmer in. Focus in. If you have a site that’s designed to lead tourists to the best places in town, a page about Italian restaurants and museums isn’t as targeted and many people will skip it in favor of something more specific. You can always add additional pages to your site, and link from one article to another. When writing your page description, try to answer a question or offer something to the reader. This gives a searcher an early idea of how your page is useful. The more useful your listing appears, the more likely someone is to click on it. End all website meta descriptions with a call to action. When a reader finishes reading what you have to offer—whether it’s a product, a recommendation or information—use the call to action to encourage them to take the final step and click. Create more content. The more pages you have, the more searches you’re able to appear in. There are only so many keywords or phrases you can target with any given page of content; by increasing your content, you’re increasing your reach. Use rich snippets to draw a searcher’s attention to your listing. Rich snippets are a type of data markup that is included in your Google search listing. Once you’ve adjusted your listing to include them, it may show a star rating, a price or other information from your page, which can help distinguish your page in a list of results. 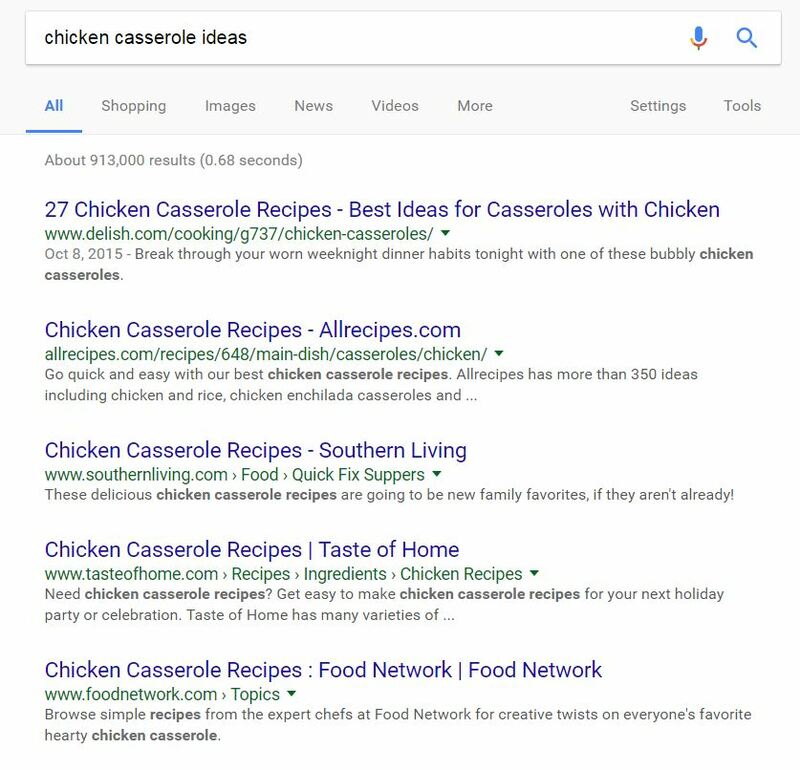 Target uses detailed keywords in their URL, which is proven to help increase the organic click through rate of that entry relative to other results in a Google search. Once you’ve developed a strategy to get higher click through rates, test it. Since there are many different approaches to combine, which ones work for you will depend on your brand, site and audience. Try a few different strategies with similar pieces of content at once to see which draws in more clicks and repeat viewers. Once you’ve narrowed down the types of changes that work best for you, remember to go back and adjust your older content. Make sure every piece conforms to your new approach for a higher click through rate, which will increase overall traffic to your site, especially if you’re focused on evergreen content. Don’t stop testing just because you find a strategy that works. Web marketing is a changeable field and what works today may not yield results tomorrow. More importantly, you may come across a new idea, test it, and find that it produces an even higher conversion rate. If you play around with your old content, it also has the benefit of updating the page—which is a positive signal to your Google ranking. So don’t be afraid to keep testing as you continue to grow your business. Even when you’re trying to boost your organic click through rates, there’s no harm in testing with a paid ad, which may give you more data. Test the same ad with a few different headlines, determine which one performs the highest for conversions, and then use that headline as the title of the page you’re creating. You can use what you learn from that test to title future pages, too. At the same time, Larry Kim of Moz says that you shouldn’t change your title every week on a particular page, because Google will think it’s being “dynamically populated.” The same applies to every type of content. Try new things, but don’t go overboard. Choose a few pages for testing–not your entire site. 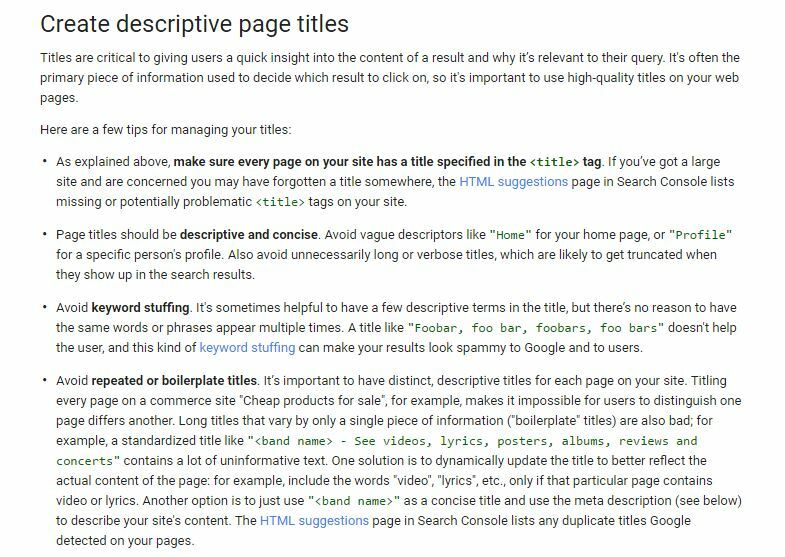 Google has a lot of great suggestions for optimizing your titles, too! Increasing your organic click through rates by improving your search result appearance, offering answers to questions and distinguishing your listing will expose your brand to more people. It’s also beneficial to optimize past content so that you have more listings appearing for more search terms. As you implement and test different ways to increase your organic click through rate, you’ll also be building your customer base and brand—so keep tweaking your site until you have the results you want. Your site will draw more viewers as you optimize your listings and increase the utility of your search results. This guide helped me a lot to learn more about blogging , SEO , Driving the right traffic to my website , and much more , thanks very much ! Thank you, Adam! I appreciate that. It is really very informative post and I totally agree with your points. The Title Tag heavily affects rankings, so it is absolutely required to write a title that is both a balance of eye-catching, informative, and keyword rich copy. Thank you for this post. It’s useful for me and other newbies. Thank you, David! I’m glad it was useful. It is really very informative post and I totally agree with your points. The Title Tag heavily affects rankings, so it is absolutely required to write a title that is both a balance of eye-catching, informative, and keyword rich copy. Eventually, thanks for sharing these valuable tips with us. Thank you, Amar. It can be tricky to come up with the right title, but it’s absolutely worth the time.